Okay, now it’s my turn for an interview in the Winter Blog Blast Tour, and what better way to start than with the amazing Mitali Perkins? In The Not So Star-Spangled Life of Sunita Sen and Monsoon Summer, Mitali brings us characters struggling between cultures  Indian and American. In her book Rickshaw Girl, we enter the world of a strong girl in Bangladesh bending the rules to help her family survive. 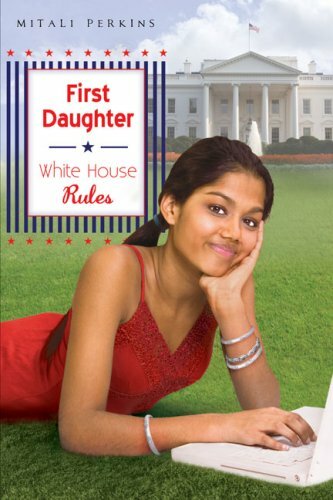 Her First Daughter books break new ground in blending South Asian issues into the all-American White House. All this, and she has a fantastic, must-read blog that brings issues of race, culture, and diversity to the forefront of books, films, and life. I read First Daughter: Extreme American Makeover a while ago, but reading it during the election was really interesting in some of the parallels that came up. There’s John McCain’s daughter, adopted from Bangladesh. There’s the actual makeover itself, which brings up thoughts of the Palin makeover. There’s the issue of Sameera’s name not sounding American enough, like Barack Obama. What did you think of all this during the actual campaign? Feel a little bit psychic? I did! Wow! And I wrote the books before either Senator decided to run, and before I even knew Bridget McCain existed, before the world had heard of Wasilla, Alaska. Just pray I don’t write about the mysterious disappearance of a stylish blogging mother who lives somewhere in Virginia. Mwahahaha. In First Daughter: White House Rules, you really had to know your way around the White House to be credible. How did you do your research? I wrote to the White House and my Representative (Barney Frank) and tried desperately to arrange a tour, but I couldn’t seem to make it happen. So I read, read, read, and exercised my imagination as much as I could. I drew sketches and looked at hundreds of photos. During a trip to D.C., I walked around the periphery and studied the gardens. The White House Historical Association’s site is fantastic. And when I found out about a secret underground passageway, I knew I had to put it in the book. It seems that when political figures are presented in books or movies, they are almost always portrayed as Democrats  but your protagonist’s parents are Republicans. Why did you make that choice in the story you wanted to tell? I like to cross borders and shatter stereotypes, so I decided that in a book by a Boston-based writer of color published in New York, it would be good to make Sparrow’s Dad a Republican. I wanted to reach out to readers in red states who don’t often see people in books who vote like their parents. I guess I was hoping that the books might get into the hands of readers who might not specifically be on the hunt for a “multicultural” read. Truth be told, I’m not sure that strategy worked, but you have to try stuff, right? There’s a thread of religion running through the two First Daughter books. In the first book, the mother is sure of her faith, but the father keeps his views quiet. In the second book, there’s an issue between someone with Hindu beliefs and someone of Muslim heritage. What place did you want religion to have in your books? Teens care about their faith. Why leave that thread out in our books? The First Daughter books are realistic, contemporary novels, and I can’t imagine a teen in America today not thinking about or confronting the issue of religion. You started the actual Sparrowblog along with the Sparrowblog in the First Daughter books. What was that experience like and how is the blog doing these days? Where do you see it going from here? The blog has taken on a life of its own. Since their Dad won the election, searches for “Sasha and Malia Obama” are going through the roof. Many of these Googlers find their way to Sparrowblog. Go ahead and search for them  you’ll be amazed at how high up my fictional character’s blog appears in the results. I’m going to stop with the inauguration in January (unless something miraculous happens either with the books or the blog to tempt me to keep going), but it’s been a blast, and Sparrowblog gets thousands of unique visitors every day. When are we going to see more books in the First Daughter series? No more, sorry, barring that miracle I talked about. Your new book, Secret Keeper, comes out soon. What can you tell us about it? 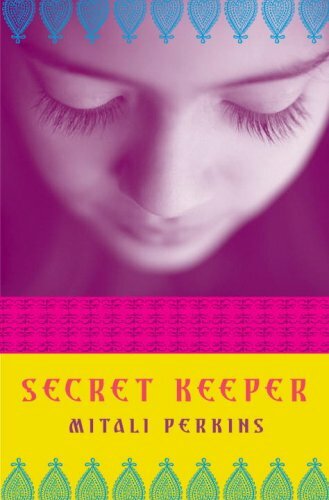 Secret Keeper (Random House, January 2009) is the story of a girl with the gift of making people feel safe enough to tell their secrets. I hope everybody has a person like that in their lives. It’s also a universal story about the bond between sisters and the power of sacrificial love, but is particularly set in Calcutta, India, in the 1970s. I hope, hope, hope my readers like it, even though it’s not my usual happy-go-lucky kind of story. Well, we’ll see. I’m in that scary pre-publication stage of waiting for reviews. I’m finishing up a pay-the-bills project, a commissioned short novel about magic and dolls, and revising Bamboo People, my first book with a boy on the cover set along the Thai-Burma border, which will be coming out in 2010 from Charlesbridge. I have First Daughter, need to read it. Won it at the blogging conference. Thanks for the interview, you two! I feel like I just had coffee and chatted with y'all. I found Mitali's comment about her effort to reach Red State readers very interesting. I'm a Blue State/Ex-Pat author (a British former Californian) living in a Red State, and I have to admit that I struggle with this a bit. The greatest challenge is to ensure that, even as I satirize the silliness in my small Southern town, I do so with sympathy. Not easy, but,as Mitali's comments encourage me to think, necessary. Thanks for a grand interview. You know, that's a really interesting -- and good -- thought Mitali had about the Red State thing. How weird it must be to be a person of color holding Republican ideals; it's like a double minority thing, and could probably make teens feel isolated and weird, especially now. Even if it didn't work, what an awesome idea to reach across the lines there, Mitali. And MotherReader, thanks for interviewing someone we all know and love; one of the worst things about being part of the great kidlitosphere is that we can't really ask anyone to review our books or interview us because it's ...weirdly unethical. So, kudos for asking! Secret Keeper sounds intriguing. Sisters, India, sacrificial love---three deep lodes with long histories of fueling great stories. Can't wait to see it. I agree with Susan ... a great chat. The Secret Keeper sounds fascinating. Fantastic interview--I love hearing from Mitali! And now I really want to go about getting an early copy of SECRET KEEPERS. How fascinating it sounds! Interesting that there's a story behind Sparrow's Republicanism - to be honest, I went into the book expecting the protagonists to all be Democrats (What? No, not showing my bias or anything). And when I realized Sparrow's dad was a Republican, it caught me by surprise - in a good way, because, like TadMack pointed out, there's so little discussion of minority conservatives - and so much to ponder. Good interview. Very thoughtful and insightful. Thanks. Thank you so much for including my interview with Christine! Loved the interview. It's always good to hear from Mitali. Bring on Secret Keeper! We're all such blogging buddies around here that I feel like a poser showing up on the rock star author side of WBBT, but what the heck? Anything for Mother Reader. Thanks, everybody, for your nice comments. Wow. This completely made me want to run out and read everything by Mitali! Great interview! I applaud your idea of reaching out to Red State readers. Yes, it is a gamble, but I'm glad you are taking it. I'm going to read these books! Great interview! And thanks for including my interview over at Tea Cozy on your list. I really appreciate it! Great questions! I really like how you explored religion and politics with Mitali. BTW, I had the pleasure of meeting Mitali at her book signing for First Daughter, and she is just as gracious in person as she is on her blog. I love that she threatened you. Oh. I loved the rest of the interview, too. But that part made me adore her. I remember reading "May you be the mother of a hundred sons" by Elisabeth Bumiller when it was first published more than 10 years ago and thinking that it was a refreshing look at Indian women and that it did NOT stereotype Indians in the way that other western writers did before. In fact I was very impressed with the fact that she met with and described women from all strata of society from village women to Ela Bhatt to kitty party socialites in Delhi to Calcutta poets and actresses. There was very little one could generalize about such a wide range of women but the fact that they were bound geographically... and that is what I really appreciated about the book: that she refrained from drawing the same old sorry conclusions about the plight of Indian women, but instead brought out the diversity. At the time that I read it, I felt that only someone who was either Indian herself or had lived all her life in India could possibly see that diversity for what it was. So it was to Bumiller's credit, I felt, that she was able to reach that point in her travels and experiences in India.